Congrats to the finalists, commissioner Zito and Cali Iverson. May the best team win. You didn’t want to face the Dutchess Dawgs in the playoffs. Not this year. Remember the Dawgs. The team which won the championship last year and quashed all bridesmaid talk. Also the guy who finished in the money the past four years – 1st in 2013, 3rd in 2012, 3rd in 2011, and 2nd in 2010. Count yourselves lucky, but the Dawgs were overdue for some rough sledding this season. The big pups were peaking at the close of the year, scoring more than 100 in each of their last three games. And they beat the champs of each division. 1. There’s no defense in fantasy football – Well not really, you do have a defense/special teams unit (D/ST), which can score points for you. But you have no control over the team you are playing. and in 2014 the Dawgs’ opponents scored 1230 points in 13 games, more than a hundred more than the next ranked game. So even though the Dawgs scored 1285 points, the second highest total in the league and just 11 points behind the leader, they failed to make the playoffs. .
2. The fantasy screw – There are games where one opposing player can run your best-laid plans. Games where Joe Flacco throws five touchdown passes…in the first quarter. Games where Marshawn Lynch scores four TDs. And the killer, when Justin Forsett, another Raven, whips up on an opponent and knocks the Dawgs out of the playoff hunt. 3. The law of averages – The Dawgs are a contender every year. Since 2010, they have finished third, first, fourth and third in overall scoring. But here’s the rub. In the same timeframe, they were 11th, 9th, 12th and 11th in points against – where 12 is the best number. The law of averages caught up with me. 4. Oh, those injuries – Yeah, it’s football, and every team suffers injuries. But some are more galling than others. Like the busted collarbone on his first carry of the game, a 53-yarder that knocked out B.J. Spiller for the season. And even worse, led to a one-point loss for the Dawgs. 5. Tight ain’t right – The Dawgs played six different tight ends in the regular season – Jordan Reed, Dwayne Allen, Jared Cook, Owen Daniels, Charles Clay and Greg Olsen. And they didn’t score a single touchdown between them. On yes, then there’s my creed – reality beats fantasy. Not gonna root against the New York Giants for anything, not even for a fantasy title. There’s fantasy, and then there’s reality. And never the twain shall meet. Remember, if you can’t run with the big Dawgs, stay on the porch. Bear with me, dear reader. A little self promotion here. The SportsLifer needs to gloat about his fantasy football team, the Dutchess Dawgs, 2013 Nightcap Football League (NFL) champions. Always a bridesmaid until this year, the Dawgs began play in 2007, compiling the best record in the league but losing in the finals. In the seasons following, the Dawgs finished second twice and third twice (in the money), but failed to capture the big one. That all changed in 2013, when the 9-4 Dawgs took the wild card route and won three straight playoff games for the coveted title, knocking off the top-seeded Canucks in the championship game. After losing their opener, the Dawgs won four straight before losing three of the next four. But after a disappointing loss to the last place Brawlers, the Dawgs ran the table with seven straight victories. The Pups were led by top-ranked receiver Josh Gordon, second-ranked quarterback Drew Brees and kicker Matt Prater, and the fourth-ranked Cincinnati Bengals defense. Brees and Gordon carried the team. Brees had six games of 38 or more points, including four of 40 plus. Gordon, who was suspended for the first two games of the year, set a record for receiving yards in successive games with 498. Besides Gordon, the Dawgs featured two other top 15 receivers — Antonio Brown (#6) and Anquan Boldin (#15). The team had to overcome season-ending injuries to #1 pick (third overall) running back Arian Foster, and tight end Jermichael Finley. Despite some underachieving early picks — Foster, third pick Victor Cruz and fourth pick Lamar Miller — the Dawgs went all the way. Free agent find Zac Stacy helped plug the gap as #1 running back. More than 27 million Americans live a fantasy life. They play fantasy football. 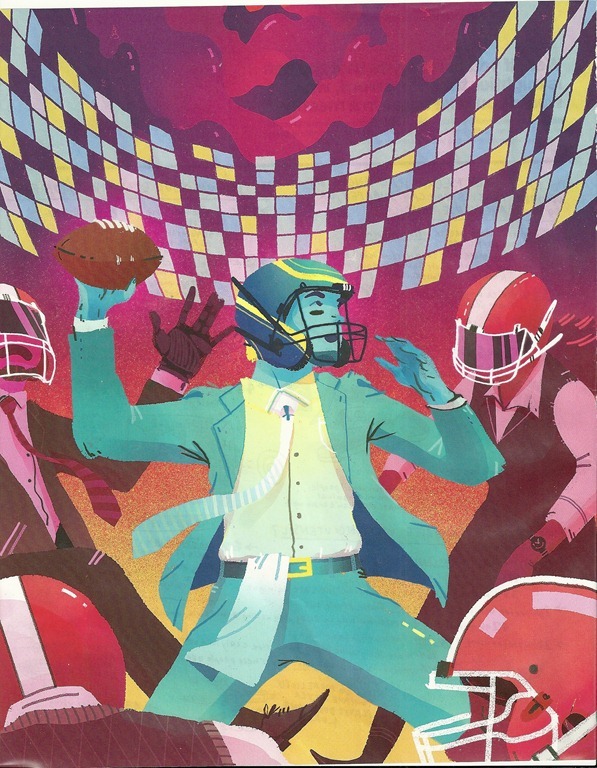 According to a recent feature in AdWeek by Anthony Crupi — headlined ‘Billion Dollar Draft’ — media companies are cashing in on that sports obsession. This year, we’ll spend an estimated $800 million per year on fantasy sports media products and services, according to the market research firm Ipsos. And football gets 71 percent of that spend. Way before the Internet, fantasy football started as a small cottage industry which tested the math skills of owners who kept their team stats. With broadband access and mobile usage, fantasy football has grown……fast. This year, for example, ESPN’s fantasy football use is up 19 percent year-to-year. ESPN’s fantasy site had more than 100 million page hits in the first month of the season, according to AdWeek. ESPN hosts my fantasy league, the Nightcap Football League (NFL), a group of current and former IBM PR guys who are living out their GM fantasies..
My team, the Dutchess Dawgs, has won three division titles in four years, and advanced to the championship game three times– only to lose each time. This year the Dawgs are struggling just to stay in the playoff hunt. Losing first pick Jamaal Charles for the season in game two hurt…..as have recent injuries to Miles Austin, Ahmad Bradshaw, Julio Jones, AJ Green and Shonn Greene. But the Dawgs have managed to hang around, fueled by recent waiver wire acquisitions like Marshawn Lynch, Brandon Pettigrew and Earl Bennett. With just two weeks remaining in the season, the 6-5 Dawgs are locked in a three-way tie for the Nightcap Superman Division lead. Having said that, the Dutchess Dawgs, fresh off their third divisional title in four years, are enjoying a bye week in the Nightcap Fantasy Football League (NFFL) playoffs. The Dawgs are the SportsLifer’s entry in the fantasy football. But my rooting interest in the real New York Football Giants takes precedence over any individual activities on the fields of fantasy. That explains why the Giants defense/special teams and running back Ahmad Bradshaw play for the Dawgs. And why there are rarely any Cowboys, Eagles or Redskins on the Dawgs roster. After jumping out to an 8-2 record, the Dawgs come limping into the playoffs in the throes of a three-game losing streak. Three lead dogs on the team — quarterback Philip Rivers, running back Ray Rice and wide receiver Roddy White — have slumped in recent weeks, contributing mightily to the slide. Earlier this week the Dutchess entry picked up kicker Josh Brown to replace the erratic Nick Folk. Just remember, it ain’t real, it’s fantasy. Football: Is It Real, Or Is It Fantasy? 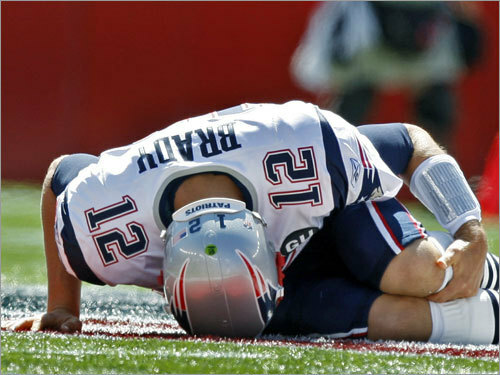 QB in pain: A sight feared by fantasy football owners and NFL fans alike. With the possible exception of dwindling 401ks, expanding waistlines and gray hair, there’s nothing fantasy football owners fear more than injuries to key players. Especially in the pre-season. Just last week, the Dutchess Dawgs took Patriots quarterback Tom Brady with the fifth overall pick in the Nightcap Fantasy League draft. Right now, the Patriots are saying the injury isn’t serious. But the Patriots are known for not being exactly forthright about injuries. So the Dawgs, gleeful that Brady was kept out of action against the Giants in the exhibition finale for both teams, must wonder if Tom Terrific, coming off serious knee injury after missing virtually the entire 2008 season, was a wise selection. Wait, there’s more. The Dawgs selected Green Bay wide receiver Greg Jennings with the 25th overall pick. Jennings got banged after making a reception last week against Arizona and suffered a concussion. Concussions are not exactly good news for your leading wide receiver. So far, the Dawgs second pick, St. Louis running back Steven Jackson, has managed to stay healthy. But Jackson has only carried the ball 10 times in three pre-season games. What happens when he starts seeing serious action? Only time will tell. Eli Manning and the rest of the Giants quarterbacks get ready for the 2009 season. In the overall scheme of life, vacations are not real. Get up when you want to get up, go where you want to go. No deadlines or meetings or conference calls. No pressure. One week is fun, two weeks sublime. In other words, it’s fantasy land. Speaking of which, vacation is a great time to prepare for the fantasy football draft. The Dutchess Dawgs of the NFL (Nightcap Fantasy League) have finished as regular season divisional champions each of the past two seasons. The Dawgs have ridden the arms of Tom Brady and Drew Brees to the championship game each season, only to loss in heartbreaking fashion in the finale..
To prepare the Dawgs for another successful season, their president, general manager and head coach “Big Dawg” Bowser has been poring over fantasy football rankings and lists from ESPN, Sports Illustrated, CBS Sports and the other usual suspects, studying everything from mock drafts to rushing statistics to injury reports. This year, the Dawgs have gone above and beyond the call of duty in their draft prep. 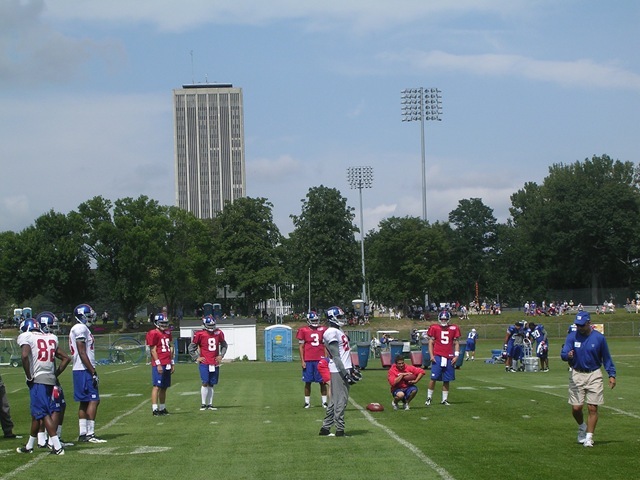 First, a team official visited the pre-season training camp of the New York Giants at University at Albany to scope out the talent on a team many experts are picking to win the NFC and perhaps the Super Bowl. Following that, the same Dawgs official spent a few days at Stanford University, soaking up the campus karma of former Cardinal quarterbacks John Elway and Jim Plunkett and then checking out Stanford Stadium, shown right, the site of Super Bowl XIX between the San Francisco 49ers and the Miami Dolphins. It’s all part of a well-planned program designed to put the Dutchess Dawgs over the top in 2009. Big decisions need to be made in the early rounds of the fantasy draft to fortify key positions. But the work doesn’t end there. Oftentimes success is achieved in the later rounds of the draft, sleeper picks that can make a huge difference as the long season wears on. Built for the long haul, the Dawgs are geared for championship success this year.